THIS IS A very classy Caribbean villa indeed. No wonder the owner's stated aim is to appeal to "discerning travellers and travel aficionados". Aficionados? That's us. We're pretty discerning too which is why Casa Kimball makes our top private villas list. This could be Blofeld's island stronghold (the classic Bond villains always had a MUCH funkier class of pad than 007 himself) perched on the edge of a cliff at the northern end of the Dominican Republic above the wild waves of The Atlantic Ocean. Designed by Rangr Studio, New York it has 20,000 square feet (6,000 metres) of space - the Dedon sofas in the living space alone offer 40 feet of loungability. There are eight suites with balconies and two bars and all those other mod cons a private villa of this ilk needs, like a billiard and entertainment room and a roof top terrace, the perfect place to drink a shot of Dominican mamajuana at sunset (if you have the stomach for it). Everywhere there are walls-of-glass windows that open to the air so you get dramatic ocean views and balmy Caribbean breezes throughout the property while dedicated staff (bartender, chef..) with names like Wellington and Kennedy cater to your slightest request. Outside, three acres (1.2 hectares) of land is planted with almond trees and scented bushes. 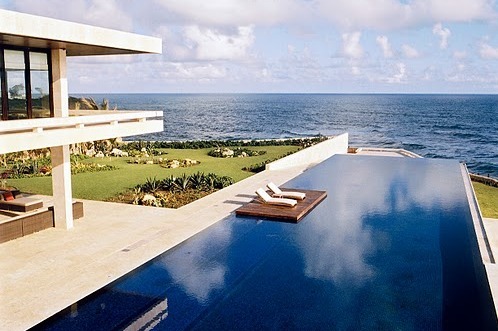 The Luxury Travel Bible loves the vast 156 foot long (47 metres) infinity pool jutting out towards the Atlantic at a right angle to the house like some watery airport runway. We're pretty fond of the cliff-side hot tub too. So where does the name come from, a traditional Dominican word perhaps? No indeed, the house is named after its fortunate owner, Google exec Spencer Kimball. Oh that we had such a villa named after us. Mi casa es su casa it seems - for the right price.